After the success enjoyed by the new AVIATOR INSTRUMENT CHRONOGRAPH range presented at Baselworld 2014, the Manufacture in Le Locle is offering a sporty interpretation for the end of this year. This new model reaffirms, the sporting, virile side of its nature with a new DLC-coated case framing a black Superluminova- enhanced dial and fitted with a vintage-style brown strap. The functions and detailed finishing remain identical: hours, minutes, date through a window at 6 o’clock, central chronograph seconds hand, 30-minute chronograph counter at 3 o’clock, 12-hour counter at 6 o’clock, small seconds at 9 o’clock. In a nod to aviation, the latter recalls the “Alarm Flag” featured on the frequency altimeter appearing on cockpit instrument panels. The dynamic design of this model is further enhanced by the openworked oscillating weight providing a glimpse of the movement. A new visual campaign has been created in order to promote this sporty collection. It represents far more than a mere advert and came about through a singular set of circumstances. 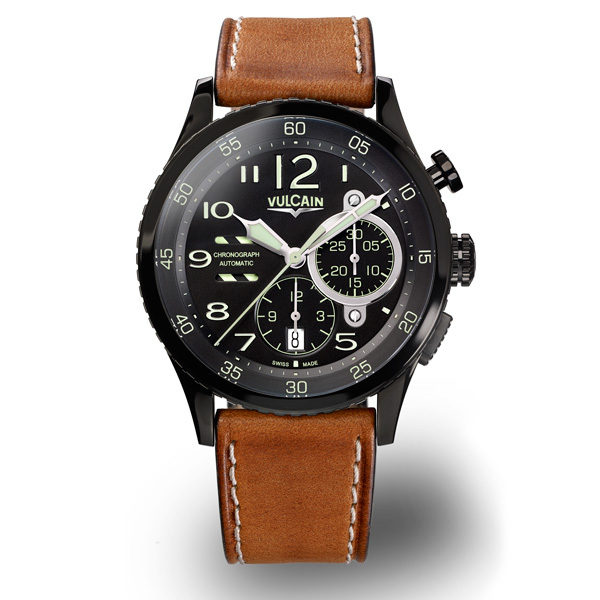 Confirming its enduring concern for quality and respect for the “Swiss made” label, Vulcain opted for this vintage-look visual created by Swiss pilots based in Lausanne. A contemporary photo with a retro touch One rainy day several years ago, in the hangar of the small Blécherette airport in Lausanne, Switzerland two pilots decided to set a special scene for their vintage Grumman TBM3-Avenger plane. A 1950s disguise and a few sepia- effect touches were enough to send this shot half a century back in time. 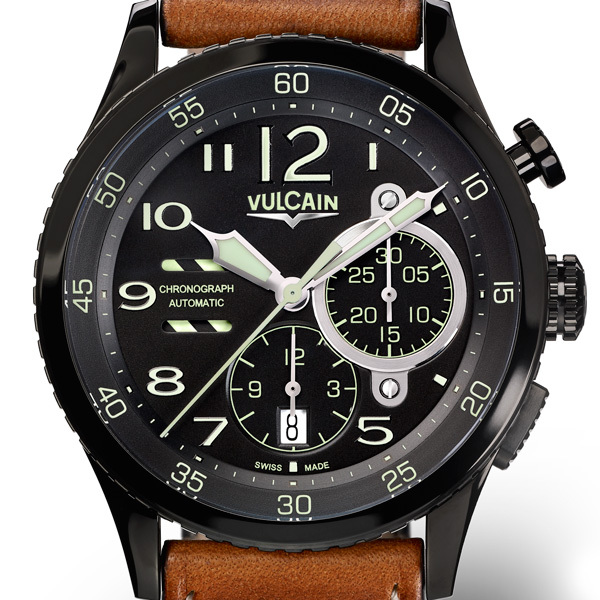 The Avenger, testimony to a proud history “A brand’s strength lies in the reality of its history and the authenticity of its product.” This emblematic statement from the Manufacture Vulcain also reflects the story of this plane, from its development through to its arrival on Swiss soil. Made in the United States in 1945, it spent its early years in the San Diego area and was subsequently transformed into a passenger and cargo aircraft in the 1950s. On June 12th 1956, it was withdrawn from active service, before being recovered in 1987 by an English pilot who had it restored to flightworthy condition after a necessary technical overhaul. Since 1989, the Avenger was shipped from the United States to England and its size must have made for some logistical issues on this crossing. It remained in the ownership of the English pilot until 2005, the year Mr Charles Trachsel of Lausanne decided to fulfil a childhood dream by acquiring this plane for his 50th birthday. 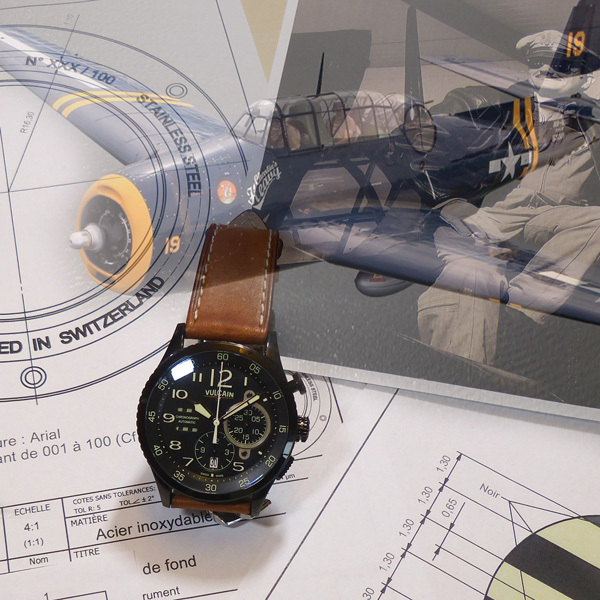 The Avenger has thus been based at the Blécherette airport in Lausanne, Switzerland since 2006 and its arrival sparked the creation of the Charlie’s Heavy association dedicated to the restoration of historical planes. This exceptional model is now presented at airshows across Europe. In 2012, it even took part in the 100th anniversary celebrations of Russian aviation, undertaking a return flight between Lausanne and Moscow involving a total of 19 flight hours.